British soldiers who fell covering the retreat of the 5th Army, in 1918. Casualties in land-forces worldwide amounted to over 37 million.About 1 million British died while deaths of the French, Italians,and people from the Russian, Austro-Hungarian, German and Ottoman empires were much higher. Image © Billie Love. Debates about the origins of wars have a habit of becoming highly politicized and very heated. The reason is that they cut to the core of a nation’s image of itself as well as its image of the enemy. The stories that nations tell about themselves, like epic poems, are filled with heroes and villains and stirring events. As Michael Howard, the eminent British military historian, noted: such stories sustain us in difficult times but they are “nursery history”. In Michael Gove’s simple view of the slide to war, the Germans were the villains and the British soldiers were the heroes. In Milne’s Marxist view, none of the imperial powers who embroiled Europe in the catastrophe of 1914 was innocent or peace-loving. Nationalist versions of history, whether British or German, French or Russian, Serbian or Austro-Hungarian, have one thing in common: they tend to be simplistic, selective, self-righteous, and self-serving. Nationalist movements always re-write history. A nation has been defined as a group of people united by hatred of their neighbours and a mistaken view of the past. “Getting its history wrong is part of being a nation”, observed Ernest Renan, the 19th-century French philosopher. The prevalence of stereotypes, inaccuracies, and distortions in nationalist historiography is not accidental; it is in the nature of the beast. Patriotic history is by definition partial and partisan history. It is driven not by an objective search for truth but by a political agenda, and most commonly by the desire to rally all segments of society behind the ruling party and to present a positive image of the nation to the outside world. Historians who challenge the reigning orthodoxy about the past frequently arouse the ire of the political establishment of the day. “Historians are dangerous people”, thundered Soviet leader Nikita Khrushchev, “they are capable of upsetting everything”. And long may they continue to do so! For the task of the historian is not to buttress nationalist narratives but to subject the claims of both sides to rigorous scrutiny in the light of all the available evidence and to discard those notions, however deeply cherished, that do not stand up to such scrutiny. Indeed, it is the duty of the historian to hold a mirror to society, to convey uncomfortable home truths, and to speak truth to power. From an educational point of view, the subversive role of history is thus of supreme importance. As a student of Israel’s past I am no stranger to controversy and I know only too well how prickly politicians can get when their pet notions about the past are subjected to close empirical interrogation. I belong to a small group of scholars who in the late 1980s began to challenge the standard Zionist version of the Arab-Israeli conflict. Ilan Pappé and Benny Morris were the other leading members of this group though Morris radically revised his views following the outbreak of the second Palestinian intifada in 2000. Collectively we used to be called the revisionist Israeli historians or the “new historians”. Using official documents released under Israel’s liberal thirty-year rule, we re-examined many of the myths that have come to surround the birth of the state of Israel and its post-independence policies towards its neighbours. We assigned to Israel a far higher degree of responsibility than was generally accepted for causing, escalating, and perpetuating the Middle East conflict and we refuted the notion that all of Israel’s wars have been defensive wars. Much in the same vein as Gove’s attack on left-wing academics, my colleagues and I were vilified as traitors who deliberately set out to deprive young Israelis of pride in their country and confidence in the justice of their cause. Loyalist historians, like Professor Anita Shapira of Tel Aviv University, lambasted us for our alleged pro-Palestinian bias, and regurgitated the conventional wisdom by portraying Israel as the wronged party, and as the innocent victim of Arab predators. Aharon Meged, a prominent novelist, went even further in an article in Ha’aretz, warning that we were leading our country towards collective suicide. Meged could at least claim poetic license but some of the wild charges against us ran the risk of giving paranoia a bad name. The debate quickly spilled from the academy into the public arena and initially it focused on 1948, on the conflict which Israelis call the “War of Independence”. Politicians were particularly troubled by the prospect that our interpretations of Israel’s birth and early years would affect the teaching of history in Israeli high schools. The new historiography was seen as thoroughly subversive. Benny Morris, for example, drove a coach and horses through the Zionist claim that Israel was in no way responsible for the Nakba or the catastrophe, for turning over 700,000 Palestinians into refugees. Proof that Israel played an active part in creating the refugee problem entailed responsibility for solving it, a responsibility that Israel continues to deny to this day. Ilan Pappé demonstrated that Britain’s aim, in the twilight of the Palestine mandate, was to abort the birth of a Palestinian state not, as Zionist historiography maintained, to prevent the birth of Jewish state. 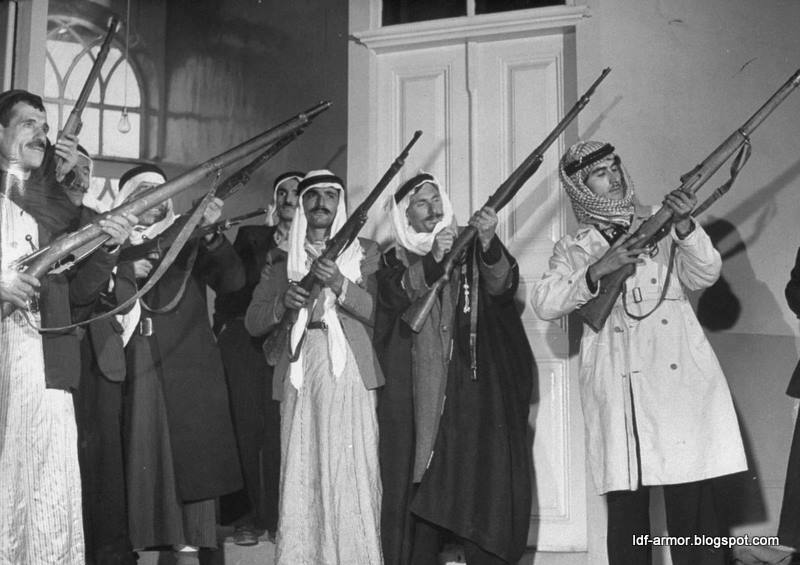 Members of the volunteer Arab Liberation Army 1948, created by the Arab League. They were untrained and quickly defeated. Another tenet of Zionist historiography was that the seven regular Arab armies that invaded Palestine in May 1948 did so with the united aim of strangling the infant Jewish state at birth and throwing the Jews into the sea. Our research revealed that the Arab rulers who made up this ramshackle coalition in 1948 were deeply divided among themselves and that one of them, King Abdullah of Jordan, was in fact in cahoots with the Jews against the Palestinians. This was the thesis I advanced in my 1988 book Collusion across the Jordan. Abdullah and the Zionist leaders, I argued, conspired to divide up Palestine between themselves at the expense of the Palestinian national movement which laid a claim to the whole of Palestine. Another cherished notion in the collective memory was that of a heroic struggle against overwhelming odds of the few against the many. We did not deny the courage or bravery of the Jewish fighters but we did point out that, in the Palestine theatre, they outnumbered all the Arab fighters, regular and irregular, put together and that their ultimate victory was not a miracle but the result of the military balance. We also differed from the orthodox historians on the reasons for the persistence of the political deadlock after the guns fell silent. They claimed that Israel’s leaders whole-heartedly strove for peace but there was no one to talk to on the other side. We demonstrated that on the other side there were pragmatic rulers eager to negotiate but that Israel’s leaders were inflexible, rejecting any territorial compromise and denying the right of return of the Palestinian refugees. Our conclusion was that the quest for peace in the Middle East was frustrated more by Israeli than by Arab intransigence. Another sacred cow was slaughtered. The cumulative effect of all our books was to undermine the popular-heroic-moralistic version of the first Arab-Israeli war which was taught in Israeli schools. The new history was a history that made a difference. What a decade earlier would have been dismissed as dangerous radicalism began to infiltrate into the intellectual mainstream. Our left-wing friends even started to tease us for having morphed from Young Turks into old jerks. But the political establishment remained adamant in rejecting the new interpretations. In the run up to the elections of 2001, Ariel Sharon, the leader of the right-wing Likud party, was asked what changes he thought the education system needed. He replied: “I would like them to study the history of the people of Israel and the land of Israel…the children must be taught Jewish-Zionist values, and the ‘new historians’ must not be taught”. In most contexts, as in the British and Israeli ones, patriotic pride does not make for good history. The real value in studying history lies not in garnering evidence for conflicting nationalist narratives but in gaining a detached and unblinkered view of the past, and especially of the origins of wars. War is said to be too serious a business to be left to the soldiers. By the same token, military history is too serious a business to be left to the politicians. When politicians pontificate about the past it is rarely in the disinterested pursuit of a complex truth and more often in order to score party political points. And when politicians invoke the “lessons of history” they usually have a hidden or not so hidden political agenda. People in power who assume the heavy responsibility of taking their country to war almost invariably claim that they had no choice. But in most cases the notion of TINA – there is no alternative – is false. Like patriotism, it can be the last refuge of the scoundrel. As Margaret Macmillan notes in the conclusion to her magisterial work on the outbreak of World War I − The War that Ended Peace – “There are always choices”.